‘Padded and glittering’: Hailey Bachrach reviews the musical take on Marvel. You may be familiar with the titular characters of Thor and Loki from the Marvel Comics film franchise. And you may be familiar with the apocalyptic event that they must seek to avoid from the best-ever Marvel film (sorry Black Panther), Taika Waititi’s Thor: Ragnarok. Yes, it’s another story about Ragnarok, the great battle in Norse mythology that will bring about the end of the world and the death of the gods. But this Thor is – no offence- no Chris Hemsworth. He’s may be the size of one of Hemsworth’s biceps. And he’s not entirely sure that he’s entirely cut out for this whole hammer-wielding, strongest-being-on-earth gig. Also, it’s a musical. With book and music by Harry Blake (who also plays Thor), Thor and Loki is a daffy semi-parody with a heart, a giddy exploration of those classic musical theatre themes like who you are, who you love, and where you’ll find space for a tap number. 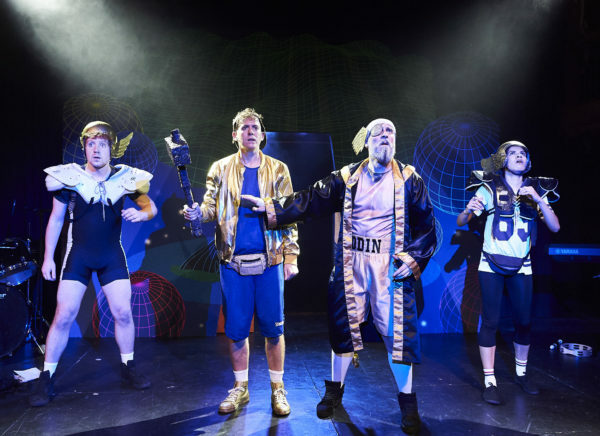 Designer Amy Jane Cook equips the gods of Asgard with football pads (the American kind) and lots of gold lamé for an irreverent aesthetic that perfectly suits Blake’s tongue-in-cheek script and Eleanor Rhode’s snappy direction, which strikes just the right balance of heightened and sincere. Thus padded and glittering, the gods face off against their mortal enemies, the giants, who have an outcast of their own in their midst: the oddly scaly, cloven-hooved Loki (Alice Keedwell), who takes after her mother (Julie Jupp) in preferring peace and organic yoghurt to the preferred giant pastime of war. The object of this war is the golden apple tree guarded by Odin’s daughter Freya, who appears in the guise of a mostly willing volunteer in the front row of the audience (he only dropped the apples once). The gods have it, the giants want it. And I don’t mean to read too much into a show that features a symbolic recorder duet and a bit with a dog slipper, but Thor and Loki is basically about how stereotypical hetero-masculinity is a toxic trap that will destroy the world. Only, you know, funny. But aside from making the really quite lovely Thor and Loki into outcasts, the stubborn aggression of both Asgardians and giants is what leads their worlds to the brink of ruin, and is the source of deep unhappiness for, we learn, far more people than just the openly odd titular duo. The barrier to self-expression is social expectations, which isn’t new in musicals—but in this case, a set of social expectations explicitly tied to violence, dominance, and masculine posturing. But again, like… funny. Even given this, I can’t exactly claim Thor and Loki is radical. But the point of its format is the familiarity, the classic musical theatre beats passed through the lens of Blake’s particular dry but deft humour—and through surprisingly contemporary angles, like an unexpected romance. Another parallel I couldn’t help but draw between this and that one little movie about Ragnarok: between them, there have been two stories this year that unabashedly suggest that, rather than something to be feared, the end of the world might just be for the best. This is the most 2018 mood imaginable. The world is possibly irrevocably crap, fundamentally designed to keep us from really connecting or expressing ourselves, all that’s left to do might be to burn it down and, once everything is gone and everyone is equal, rebuild something more just and loving from the ashes. Only, you know. Funny. And with glitter. Thor and Loki is on until 26 August 2018 at the Assembly Roxy. Click here for more details.